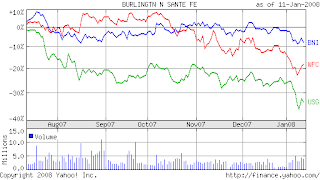 Three stocks Buffett has purchased recently have fallen from his purchase prices- USG, WFC, and BNI. All three are great businesses with competitive advantages, and they would be great places to begin doing research. Land which is on the book at 1.7 billion dollars has a "conservative"average cost basis of about 50 years ( some of the purcahses are on books pre1900) at a 3% annual appreciation the land is probably worth more than 8 billion and chances are that number is UNDERSTATED. The terminals probably are worth another 3 billion conservatively and the long term debt which includes leases is about 11 billion .So 100 billion dollars of assets -11 billion of debt is about 89 billion dollars.The whole company can be purchased for under 28 billion at todays closing price. I can not attest to the validity of that analysis, but if that is accurate that would be an interesting place to start researching. Buffett also mentioned that as fuel costs rise, the comparative advantage of rail vs. trucking widens because fuel makes up less of rail's total costs. I've been looking into USG recently, and I will post some information on that shortly.